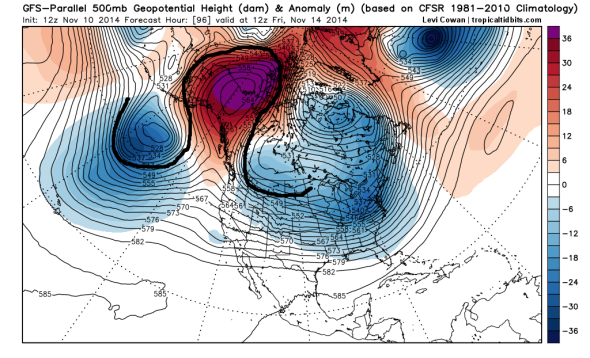 The Omega Block: Your wintry companion for at least the next two weeks. This is the Omega Block. Get used to it—it’ll be here for awhile. North America’s weather is a complete mess right now. And it’s not about to change anytime soon. Thanks to a boost by the impressive extratropical remnants of Typhoon Nuri, which over the weekend likely became the Bering Sea’s most intense storm on record, the atmosphere has entered an extreme pattern. The highly elongated jet stream, whose circuitous route right now bends from Siberia down toward Hawaii back to the Arctic north of Alaska and then straight south toward the Midwest and East Coast, is morphing into an “Omega Block,” named after the Greek letter of a similar shape. There’s good news and bad news here (depending on your perspective). First, the good news is there’s very little chance for a crippling East Coast snowstorm at least for the next several days (though there’s one underway in the Upper Midwest right now). The bad news is, all this cold without snow is kind of a waste. But at least the maps are pretty. Thanks to the Omega Block, you can expect a map like this to be valid approximately forever. I wrote about the Omega Block back in April, when it helped usher in a four-day tornado outbreak in the Southeast. Blocking patterns like this are a recipe for extreme weather because they essentially force huge masses of air to stay put for up to weeks on end, forcing the jet stream to take unlikely routes around them. The result? A disruption in the normally orderly west-to-east flow across America, and an increased chance of weird weather. Anomalous atmospheric setups like this week’s are at the cutting edge of climate change research. Though winters as a whole are getting warmer, they may also be getting more extreme. And the temperature extremes this particular pattern will produce are nothing short of breathtaking. In Great Falls, Montana, Tuesday’s high temperature is expected to top out at a balmy -1 degree Fahrenheit—nearly 50 degrees below normal. Meanwhile, Barrow, Alaska—the northernmost city in the United States—will spend most of the week some 20 degrees above normal, with highs of about 30. 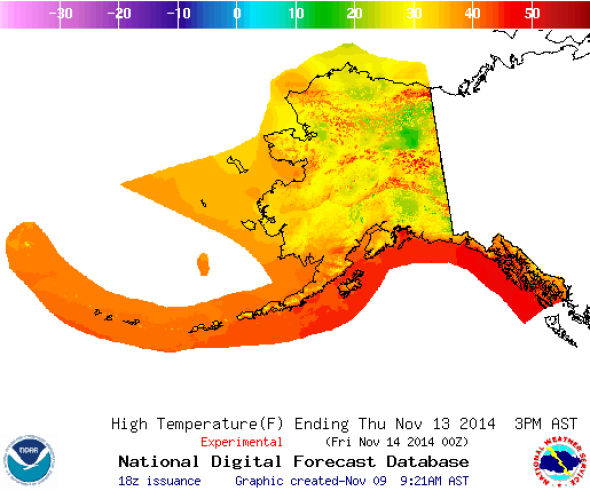 Parts of Alaska north of the Artic Circle will be warmer than Dallas this week. Some parts of Alaska’s North Slope will be much warmer than Barrow, possibly even reaching the 50s. As the Arctic cold front continues its push toward the East Coast, for a few days late this week, it’ll be colder than that in places like Dallas, Atlanta, and Washington, D.C.
As the front passed Denver, the temperature dropped nearly a degree a minute on Monday. In Marquette, Michigan—one of the snowiest cities in America—this is shaping up to be one of the biggest snowstorms on record, let alone in early November, with anticipated three-day totals nearly three feet. This week’s weather is something different than a destabilization of the polar vortex, like we saw last winter. For one, an Omega Block is semi-stable—and for that reason, it’s somewhat difficult to know how long it’s going to last. That means it can also unleash multiple waves of wintry goodness before gradually fizzling out. According to the latest long-range outlooks, something like this week’s pattern could linger all the way until Thanksgiving. Think of it as Mother Nature’s gift of an early winter that keeps on giving. For the next two weeks (at least), multiple blasts of Arctic air will be inbound. All that’s left to do is wait and weep cold, lonely, frozen tears.